In nature, monogamy is often the exception, promiscuity usually the rule, the BBC's Matt McGrath reports. 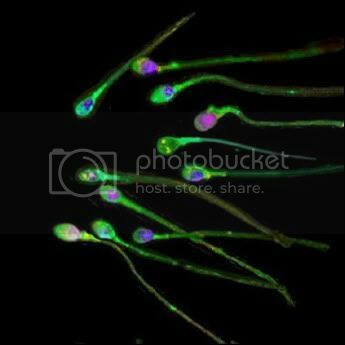 But whenever a female of any species mates with more than one male there is a battle between the sperm of the potential fathers as they attempt to fertilise the eggs. Scientists regard this type of sexual selection as a very important force for evolutionary change. Prof Scott Pitnick says it was a jaw-dropping moment when he saw the multicoloured sperm through the microscope for the first time. "It turns out that they [the sperm] are constantly on the move within the female's specialised sperm-storage organs and exhibit surprisingly complex behaviour," Prof Pitnick said. Below the fold are some other stories on this breakthrough and other related fields of study as recommended by the BBC. That stubborn, stupid 30%...it's genetic. Well well well...science marches on, and we now find some answers to one of the most puzzling questions that has haunted us over these past seven years. Remember how, no matter what facts come to light and no matter how often George W. Bush and friends are caught lying or committing other crimes, they are invariably, inexplicably supported by 25-30% of Americans? We now have an apparent explanation for this. Read more about That stubborn, stupid 30%...it's genetic.